news Communications Minister Malcolm Turnbull has claimed that the telecommunications industry and the Government are on a “unity ticket” with respect to the new tranche of national security-related telco reforms, despite sharp disagreement from the industry and a recent history of the Government ignoring industry concern on such issues. The legislation has been in development by the Attorney-General’s Department for at least a year and is dubbed the Telecommunications Sector Security Reforms. It will give the Government sweeping powers over private sector telecommunications networks, including requiring telcos to notify security agencies of key changes to networks and giving the Attorney-General’s Department the power to request information from and issue directions to telcos. This week the Communications Alliance — which represents almost all major telcos around Australia — described the bill as adding “unjustifiably, significant additional and intrusive powers to Government”, noting in an interview with ABC Radio that it believed the balance had been “lost” in the legislative process. However, in an interview with ABC Radio on Wednesday night (click here for the full interview), Turnbull claimed industry and Government were on a “unity ticket” on the issue. “The telcos want their networks ot be safe from interference, while the Government wants to be able to cooperate and help them protect their networks,” he said. 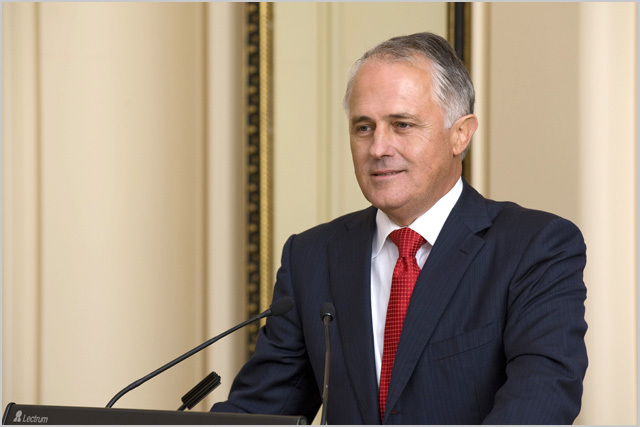 However, Turnbull acknowledged the industry viewed the new powers as “too heavy-handed”, and vowed to work with telcos on the laws. “I want to assure anyone listening … that both [Attorney-General] George Brandis and I, we will work very constructively with the telco sector to ensure that we get an outcome that is both workable and practical,” the Minister said, noting the Government was “extremely sympathetic” to the industry’s concerns. The Minister’s comments come, however, as there has been substantial evidence over the past year that the Abbott Government is not sympathetic to the concerns of the telco industry when it comes to legislation. The telco industry argued long and hard for increased clarity around the Government’s controversial data retention legislation introduced earlier this year, culminating in an unprecedented letter signed by the heads of major telcos such as Telstra, Optus, Vodafone and iiNet, seeking clarity on how much the Government would support telcos financially to implement the legislation. However, the Government staunchly refused to engage with the telecommunications sector on the cost issue and a number of other issues, leading to a situation where the industry is still confused and frustrated about the data retention policy. Is Turnbull correct that the telcos and the Government are on a “unity ticket” when it comes to the TSSR tranche of national security telco reforms? Well, partly he is. It is true that some telcos, such as Telstra and Optus, have always worked closely with the Government on national security matters. For all Telstra’s mildly voiced public displeasure with the reforms, there is a very strong two way communication channel between Telstra and security agencies such as the AFP and ASIO. It would be foolhardy of anyone to pretend otherwise. In fact, the recent data retention legislation really is basically a long overdue recognition by the security agencies that Telstra is not the only game in town anymore when it comes to telecommunications, and the agencies may actually need to start dealing with other telcos as well. However, it’s also true that the Government is increasingly riding roughshod over the telecommunications industry when it comes to legislation affecting it at the moment. We particularly saw this in the data retention legislation, where communication between the Attorney-General’s Department and the industry essentially broke down several times as the Government just stopped listening to the industry tell it things it didn’t want to hear. Turnbull has acted as a bit of a bridge between the telco industry and the Attorney-General’s Department and the security agencies at times, putting a friendlier and more collaborative Government face on some pretty intrusive policies. But he won’t be able to completely quell all the dissent over the TSSR reforms, which will doubtless become more of a public issue soon as the consultation period for the exposure draft of the legislation ends and we get to see some of the telco industry submissions. Of course, this isn’t likely to mean much in terms of the passage of the legislation. The Data Retention legislation was much more controversial than this passage, and it still went through the Parliament relatively easily. I don’t expect the TSSR bills to be held up or modified substantially, particulalry given that Labor doesn’t seem likely to pick a fight over them.